Have a companion stay with you in the hospital and at the hotel twin-share. See inclusions below. For $890 you can secure a CosMediTour Surgery Travel Warranty which if required, covers your revision surgery, flights back to Thailand and luxury accommodation. 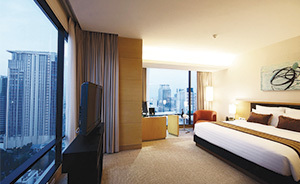 For $290 upgrade your entire stay at AETAS Bangkok from a Superior Room to a Deluxe Room. Payment Plans from $65 per week. Terms & Conditions Apply. Click here for more details. A Standard Breast Augmentation Surgery OR Breast Lift + Augmentation procedure, with smooth or textured round silicone cohesive gel implants up to 385CC, donut/lollipop/anchor(inverted “T”) lifting techniques and placement below and above the muscle are included. Larger implants, dual plane placement, tear drop (anatomical implants), and high level ptosis will incur a surcharge to be itemised in your Surgical Recommendation.